The 4.5 hour production is the second by cameraman and editor Aaron Fagerstrom (previously they chronicled a science fiction painting called "The Mechanic." ). 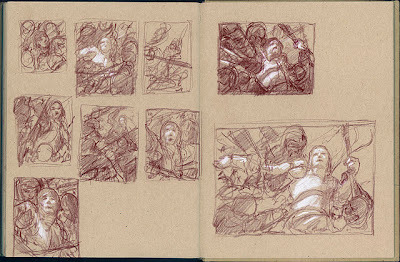 It was shot over a three five day period in Donato’s Brooklyn studio, and unspools with Donato’s narration explaining his thinking each step of the way. The project begins with the artist explaining his inspiration for the character, who captured his imagination when he visited France a few years ago. 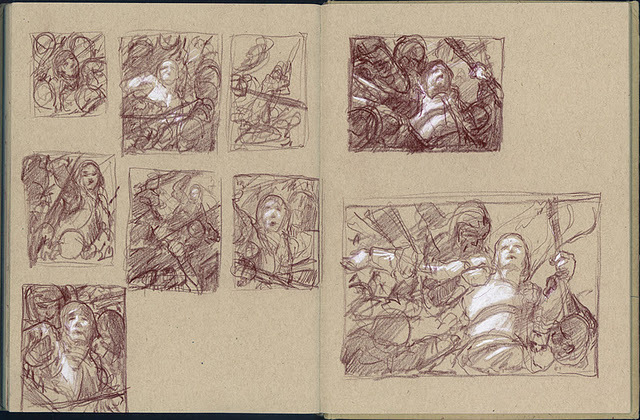 He reviews a few pages of sketches on tone paper, explaining the concept and composition. He then reviews the results of his photography session with a model posing for Joan. 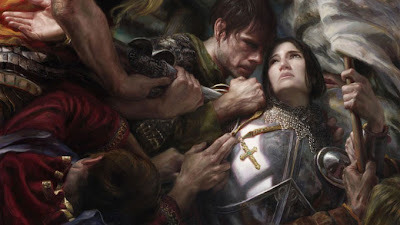 As she gazes upward, a tight cluster of other figures, members of the clergy and nobility, tug at her and hold her down. Donato puts the photos of his models in Photoshop to form a large photomontage printed out at the size of the finished painting, and then transfers it down onto the smooth gesso surface and seals the surface to prepare for the paint. This part of the sequence takes up the first hour. The remaining three hours follow his painting procedure. He is inspired by Peter Paul Rubens and Anthony Van Dyck, and he applies layers of semi-opaque paint over contrasting colors laid down in acrylic over the pencil drawing. (Video Link) This trailer shows some of the artistry of the video, but Donato's spoken commentary is muted here, so you don't get the sense of Donato's encouraging explanation of what he's doing. The vibe is relaxed, friendly, and unscripted, and the sound and images are well recorded. 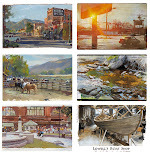 If you play it in the background while you’re working in the studio, you end up feeling like you’ve spent a few days hanging out in the studio with a leading contemporary realist, who is reaching for great themes of history and imagination, and sharing the details of his process with the rest of us. Another look at the video by Matthew Innis on Underpaintings. I've watched about a third of this DVD, and it's answering a lot of my own questions. This one seems to go into more depth than The Mechanic, which is also great. I wish I could talk while I paint, like Donato does. I read somewhere that Rubens would have musicians playing while he painted, and he'd be dictating correspondence to various clients, directing assistants, etc. @jeffjordan - it was very common for artists to have their wives, friends etc read poetry or books allowed while they painted, Sargent would also have musicians occasionally and Augustus Saint-Gaudens would sing to himself. I think James once had a post about what people listened to while they paint. yeah and Rockwell's wife would read to him while he painted. I had previously bought the Mechanic when it was on sale and listen to it almost everytime i paint. i have been itching to buy this since i first saw it pop up a couple of weeks ago. James you should do a dvd yourself.I have often thought of suggesting it. 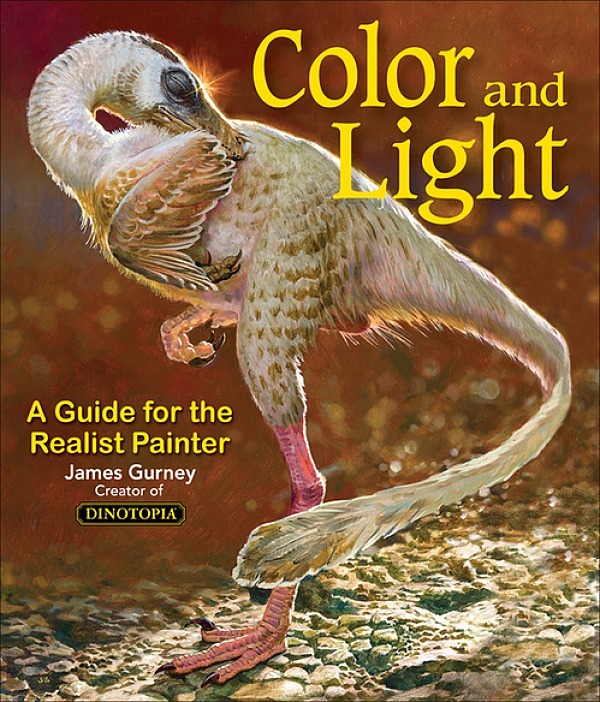 I would definatly buy a Dinotopia Painting dvd. I attended the IMC when it started in '08 and again in '10 (where I had the pleasure of working around you and your wife! ), and I was more than pleasantly surprised to discover Donato and the rest of the artists were so genuine in their belief that we are all artists before we are each others competition. I find mainstream artists eager to mentor and usher in other generations of artists was truly inspiring! 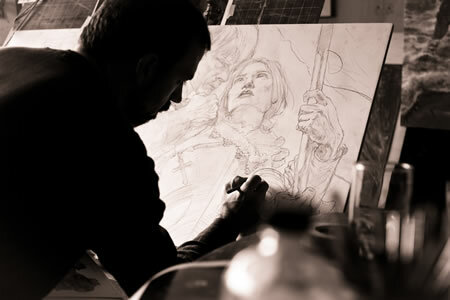 Mr. Giancola opened up his Brooklyn home/studio one day a few years ago (for a community arts day) and it was quiet an experience to spend some time there. John, I stopped by Donato's home/studio for the same public arts thing last year. I went down there just to check out his studio and meet him. My friend and I got to talk to him for a little while. He seems to be a real nice guy. His work is phenomenal in person. I don't normally buy DVD's, but I'm thinking of buying this one. Hi buddy, thanks a lot for sharing such inspiring video. This is the first time I saw such unique paintings. It's great and gives me confidence to take painting as a profession. I've watched both of his DVDs and I will continue to watch them over and over. They are excellent!!! They leave you wanting to immediately pick up a brush and begin your own masterpiece. Bad picture though, like some awful sentimental history painting from 150 years ago.